Surrounded by a private park of green lawns and secular plane trees, the villa, (of more than 700 square meters) is rented entirely to only one group of persons. It is furnished with antique paintings and furniture and it is situated on the banks of the river Adige in the town of Villabartolomea of which the ancestors of the present owners of the villa were feudal lords since the 15th century. The villa is in the heart of a highly suggestive rural setting comprised of the ample plains of the 'Great Veronese Valleys'. Here the three regions of Veneto, Lombardy and Emilia Romagna come together, offering attractions of great cultural, artistic and environmental interest. Ideal position for visiting cities and places of enormous appeal such as: Verona, Mantova, Ferrara, Vicenza, Padova, Lake of Garda and the Delta of the Po river (all within the distance of 60 Km). And Venice is only 100km far! An off ground swimming pool opens from June 15 to September 15. At the first floor (up to 12 people) there are 5 bathrooms and one toilet at the ground floor. At the second floor (additional 13 people) there are 5 other bathrooms. In the separate flat, located in the same compound, there are 2 bedrooms and 1 fully equipped bathroom (with shower). Spices, salt, initial mineral water and coffee supplies provided. Toilet paper provided. Exclusive very large family kitchen with large marble table and huge fireplace. 2 separate sink rooms adiacent with washing machine, dish washer and 2 fridges. Separate large and decorated dining room. Up to 16 comfortably sitting places. The billiards room nearby can be easily switched into a further dining room by adapting the billiard table. Table Tennis, Croquet game, badminton. The 3 nearest golf courses are at the distance of about 55 Km. from the villa. The pool is an above ground pool, 5 mt. large and 10 mt. long. Depth 1,5 mt. Villa Mila is quite simply a fantastic place to stay. 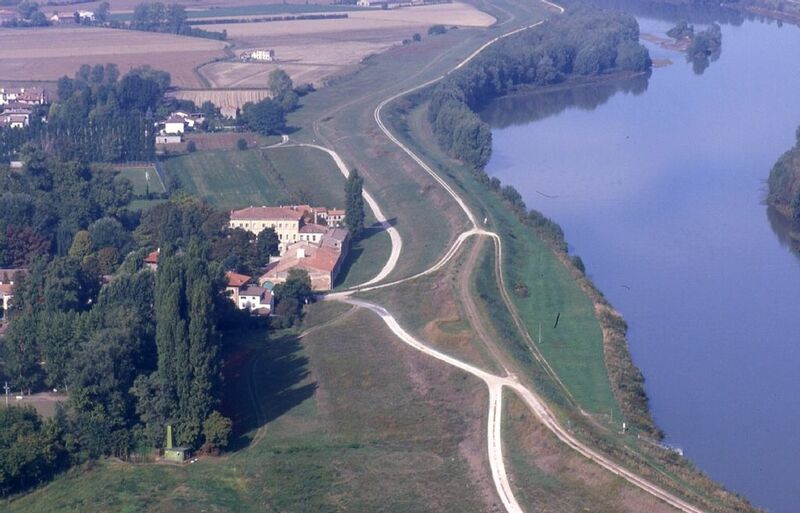 It is only 45 km from Verona and is easily accessible by train and road with easy transfers from the airport. It is situated in the small town of Villa Bartolomea which has basic but useful facilities such as a bakers shop, restaurants, coffee shops , a bar etc. It is located on the banks of the river Adige and there are fabulous paths stretching for miles for walking and cycling to nearby towns and villages. We rented Villa Mila in December for 25 people to stay for one week as we were renewing our wedding vows for our 20th anniversary. The bedrooms are all charming and have beautiful period features and furniture and the most comfortable beds. We were originally worried that having 25 people all in one house would feel claustrophobic but we were happy to be proved wrong. There is so much space and so many rooms that people could comfortably didvide themselves up depending on the activity. The teenagers tended to gravitate around the billiard room or dining room for playing music or card/board games whilst the oldies got comfortable (with wine and snacks of course) in the kitchen or beautiful living room, both serviced by open log fires. Mirella is the amazing lady that arranges everything. She runs the house along with her team of helpers and is invaluable. She arranged the celebrant, the caterers and helped with all the arrangements for the day. She offered us assistance with everything from music to flowers (most of the greenery in the flower arrangements were picked from the grounds of Villa Mila which made a lovely touch) and was always available should we have any questions or help. I cannot recommend this Villa highly enough if you are looking for somewhere to host a celebration or party. To get the level of service and detail available you would usually have to pay a fortune for a wedding or party planner. In short, we had a truly amazing time. Every single one of our guests has vowed to return and we are already trying to arrange a suitable time to return. In the summer there is the full use of the amazing outdoor barbeque area, grounds and pool which unfortunately we could not use in December but we hope to return in warmer times to fully make use of the facilities. Villa Mila, a truly unique location. If you are lucky enough to visit, you won't ever want to leave! how to say thank you for your wonderful review ? You definetly outlined in the most rewarding way the features of Villa Mila and the efforts of Mirella and our staff in assisting our Guests in the event they wish to celebrate with us. We always try to do our best in order to satisfy our Guests and their special needs and events , but we are always worried not to be able to do it completely: your words say that we got the target and we are really happy for that. We sincerely hope to see you again in Villa Mila, since in spring and in summer there are plenty of things to do and of cities and places of art to visit ! Thanks to a perfect preparation under the guidance of the wonderful Mirella (Stripe) we - a family of 20 people covering 3 generations - had wonderful days in the amazing Villa Bartolomea. We received a very warm welcome in this elegant chateau-like building, with more rooms and space that 20 people could fill, it was awesome! Days were spend in the relaxing tremendous and spacious garden or on the terrace or in the villa, chilling, chatting, enjoying the local tidbits and wines, playing - simply having a great time together. Several excursions took us to the Roman footprints and put our stay also in a historical context with cities of Padua, Vincenza, Montagnana etc. We explicitly would like to express our greatest thank you to Mirella who made the stay an unforgettable moment for our entire family in such a marvelous region of the world. We will come back! Villa Mila is a very grand house in a sleepy little village of Villa Bartolomea about 30 minutes south of Verona and close to the airports of Verona, Bergamo and Venice. We have visited Italy many times previously and have spent many happy weeks travelling around its various cities, towns and villages. We also got engaged in Italy earlier in 2015 so we wanted to have our dream wedding there. We only wanted an intimate affair with our immediate family and friends and were looking for somewhere to accommodate 26 people with enough rooms, bathrooms, a nice large kitchen and plenty of space both inside and outside. When we found this villa we thought it suited our requirements perfectly. After a couple of months corresponding with Mirella, we booked a flight to visit and have a look at it a little more. Mirella met us at the villa and she was amazing, showing us around the building and the gardens and explaining how the space had been used before by other guests. It really helped us visualise what our wedding at the villa could be. Mirella also acted as our wedding planner in Italy and was absolutely invaluable. Before we arrived we had discussed at length via email what we were aiming for and she made appointments with all of the relevant people in the village and surrounding towns – no small task when you consider that this included the florist, the priests (English speaking), the bakery for the cake, the photographers and much more. She even arranged for a bouncy castle and outdoor play centre to arrive for the children whilst we were there. Best of all however was the visit to the caterers which took place at their local restaurant and where we tasted all 8 courses of the sample menu that we had chosen with all of the accompanying wines……amazing! Mirellas organisational efforts were great and we managed to meet all of these people in the 2 days that we spent in Villa Bartolomea. Whatever we asked for, she had a solution and we couldn’t have done it without her – thank you so much Mirella. ...The villa was everything we wanted and our room was HUGE – I used it to get ready with all the bridesmaids and the mums on the morning of the wedding. Mirella also made up a single bed for Richard to sleep in for the one night before the wedding so we could keep our tradition of not seeing each other the morning of the wedding. The villa is so big, I had the whole first floor without needing to bump into Richard or see him before the ceremony. The kitchen is fairly basic but well enough equipped to make breakfast and lunches for everyone. The caterers used the villa kitchen to produce everything for the wedding meal and so all of the food was served fresh and piping hot. After our ceremony we had our wedding meal outside in the courtyard area – it was a glorious, warm day in September. If it were to rain however we did have a plan B which was to use the large area under the arches as you arrive into the property where we could have arranged the tables. There are plenty of rooms to explore in the villa including a music room, a huge front room with large paintings and a very ornate chandelier and a billiard room which was a favourite amongst the men in the group! From the villa you can walk right into the small quiet village with a couple of local shops, café’s and restaurants. There’s a really nice bakery in the village where we ordered various croissants and pastries for most mornings and they were delicious! There are some gorgeous restaurants too not far away from the village where we ate as a group. The area around the villa is also beautiful and perfect for walking and cycling. It really is a beautiful rural location. The outside space was also plentiful and it was all enclosed with gates and high walls so very safe for families with children. The pool was also great for the young ones, yes it was a raised pool but it was welcoming in the heat. One thing – make sure you don’t forget your mosquito repellent! Thank you to Mr San Bonifacio for letting us stay at your very grand villa, thank you Marta for your help and a special thank you for all the effort Mirella put into our stay making it exactly how we wanted it. We loved every bit of our stay at in Villa Bartolomea and our magical wedding in Italy and we couldn’t have asked for anything more from the Villa Mila or from our wonderful hosts. We were in all 13 persons staying at Villa Bartolomea for one week. The house is very old, but really beautiful and kept in a very authentic style. We enjoyed the big garden and the swimming pool. The manager at the house were very helpfull - thank you Mirella. It was a very hot week, so we were missing the sea. One day we drove to the seaside and it took 1 1/2 hour, so it was possible to do. The city is very quiet - a bit too quiet for our opinion, but with a car it is possible to go to cities with more pulse. The manager suggested us to go to a restaurant called agri tourismo and it was a big succes - definitely a place you have to go for dinner. All in all we had a great stay and a time to remember. We had our wedding arranged in beautiful Villa Mila and everything was even a lot more than we expected! After reading the reviews here we had high expectations but everything was like from a fairytale! Our group of 19 people was much more than satisfied! The villa itself is a monument with several different, well designed rooms. The garden is large and beautiful. The children especially loved the pool area! The villa was a perfect venue for the wedding. The ceremony and dining were both held in the garden area under the big trees. Even the weather was in our favour! +30 degrees celsius everyday! The opportunities in Villa Mila are endless! Sightseeing, sunbathing, cycling, tennis... Everything! If we had one more day there we would spend it by cycling around the beautiful area. The riverside views are breathtaking and create an idyllic feeling of small village Italy! What we also loved was the friendliness of local people. The villagers of Villa Bartolomea were extremely friendly to us after hearing that we would get married there. The location is also excellent since it´s not very far away from Verona, Lake Garda and Venice. Usually you´d be more than satisfied with all this above, but in this case Villa Mila is much more. We can´t praise the kindness, helpfulness and graceness of Count San Bonifacio enough! He made our trip special! Not to mention Mirella. She is the perfect hostess and the nicest person ever! Absolutely lovable people! They helped us in everything we needed. The moment you meet theme you feel like you have known them for years. What can we say? Is five stars enough? We´ll be back, definitely! Villabartolomea is situated in the souththern part of the province of Verona, on the banks of the Adige river, 6 kilometers south of Legnago. It is linked to Verona, Legnago and Rovigo, as well as to the Verona Int. Airport, by the 434 Transpolesana motorway (the three cities are also reachable by train). Easy access from Verona to the Milan - Venice and to the Modena – Brennero (direction: Germany) motorways as well as, from Rovigo, to the Padova - Bologna motorway. The Milan international airports (Malpensa and Linate) are far 2 and ½ hours drive and that of Venice, only 1 hour.Tennis courts are available behind the Villa. Tourist itineraries include visits to places of artistic, historical or gastronomic interest, tours in natural landscapes (the mouth of the river Po, the Lake Garda and the Prealps are nearby) and day and evening excursions. From end of June to end of August the world famous Arena Opera season offers in Verona unique musical events. All the above prices are charged up to 12 people, no discount for a lower number since the villa is rented in its entirety. Additional eight rooms are available (up to 13 people) at the 2nd floor of the villa and other 2 extra rooms and 1 bathroom in a separate flat of the same compound are also available at a fare, per person and per week, based on about the 30% of the standard weekly rate. Rentals of more than one week, excluding Christmas, New Year and Easter periods, will be granted a discount on the rental price but heating costs will be charged apart based on gas consumption. A booking deposit of 25% of the total rental price is due for closing the booking. Final cleaning costs of the entire house will be charged to the Guest at the fixed rate of Euro 300.00 up to 12 people.For any additional guest over 12 an additional fee of Euro 20 per person will also be charged and paid at the check in. The above rates and conditions may be subject to amendments according to direct agreement between Owner and Guests.